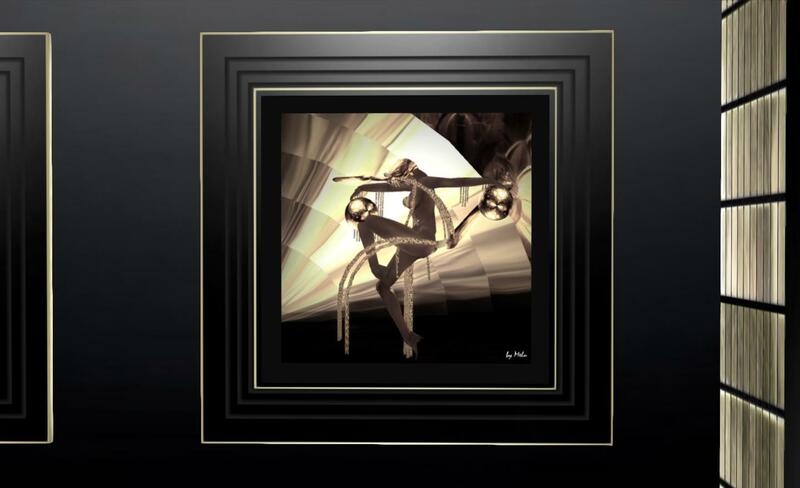 Melusina Parkin has a passion for Art Deco. Since entering Second Life in late 2008, she has kept herself extremely busy, becoming CEO of MEB Fashion at the start of 2009, and also launching Melu Decos supplying Art Deco furnishings to SL users, with stores featured in many historical and retro regions such as 1920 Berlin, Seraph City, Paris 1900, Roaring 20 Chicago, and so on. She is also a talented photographer and has had exhibitions at Galerie des Machines (Paris 1900), Schloss Museum (1920 Berlin), Café des Artistes (Paris 1900), R&D Diotima Gallery, Musee de la Duché de Coeur (Languedo Coeur), among others. 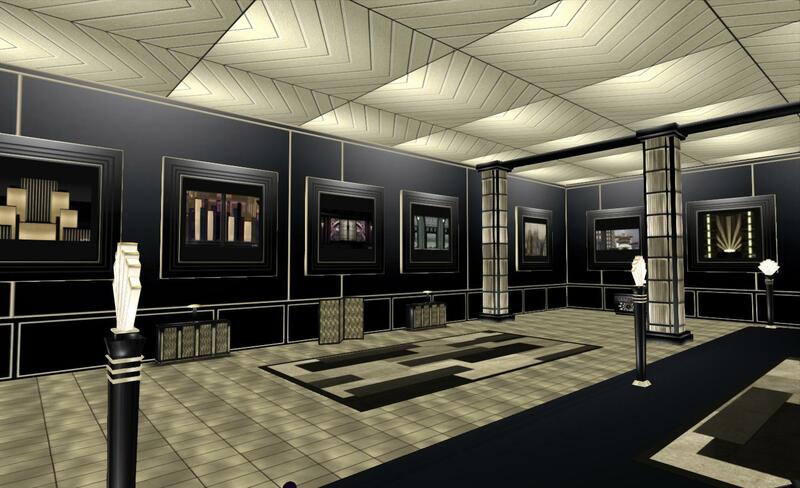 Opening at 14:00 SLT on Saturday 2nd February, Melusina now brings her passion for Art Deco design and art and her talents as an SL designer and an artist together in an elegant exhibition which will run through until (approximately) the end of March 2013. Located at the Art India Gallery on Shekhawati, the exhibition is being kindly hosted by Veekay Navarathna and curated by Quan Lavender. Quan graciously offered me the chance to preview the exhibit prior to the formal opening, which will be marked by a 20’s style Flapper Party, with invitations to all – and if you can attend appropriately costumed (while not required), so much the better! The exhibition is located in a purpose-built space Melusina has designed herself and which forms an integral part of the show, incorporating a clearly Deco style which appears at first sight simple, but which is in fact exceptionally elegant and beautifully balanced. The pictures themselves are typical of the Art Deco era both in style and presentation, and there are a couple which certainly caught my eye. The furnishings included in the exhibit are also typical of the era and demonstrate clean, strong lines which perfectly complement both the paintings and the design of the gallery itself. All of the items are mesh and had a land impact of 1 each, making them a cost-effective means of decorating a house in-world. 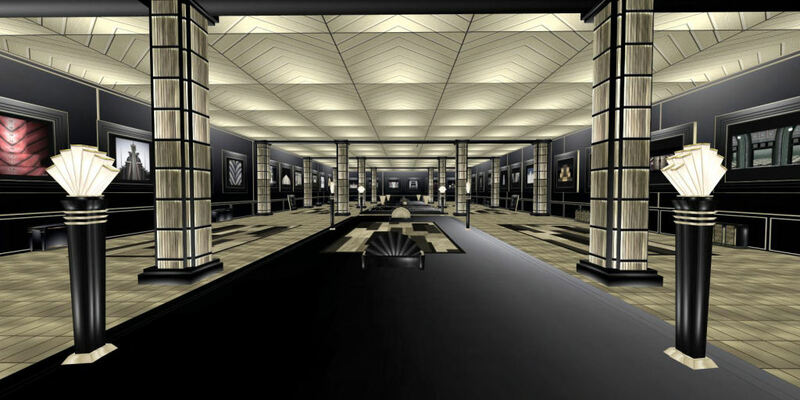 For anyone interested in Art Deco art, design and architecture, this is a must-see exhibition. 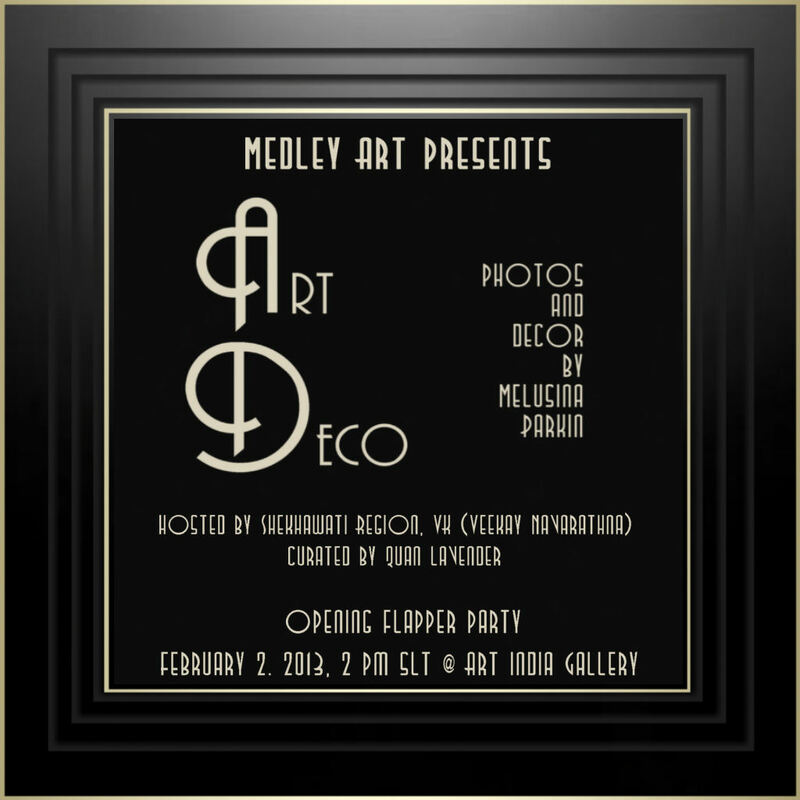 Art Deco opens at 14:00 SLT on February 2nd, 2013 and will run for approximately 2 months. As an art object creator, Melusina Parkin has been the best voted in the Virtual Museum of Architecture (VMA) Contest of Art Deco Clocks. She has presented two talks at the VMA; the first, in December 2010 was on Art Deco, and was reprinted in the SL Retropolitan Magazine. The second talk, in March 2012, was on the subject of London’s famous Battersea Power Station. As a builder, Melusina has been responsible for a number of notable builds in SL, including the MEB main store at Klio, the Look Elite Model agency lobby and academy, and the Cotton Club set for the Look Elite agency graduation show of 2012. As a writer, she covers cinema, fashion and SL destinations and collaborates on a number of in-world publications. She speaks English, Spanish and Italian (her native language), understands French, a little bit of German and Portuguese. 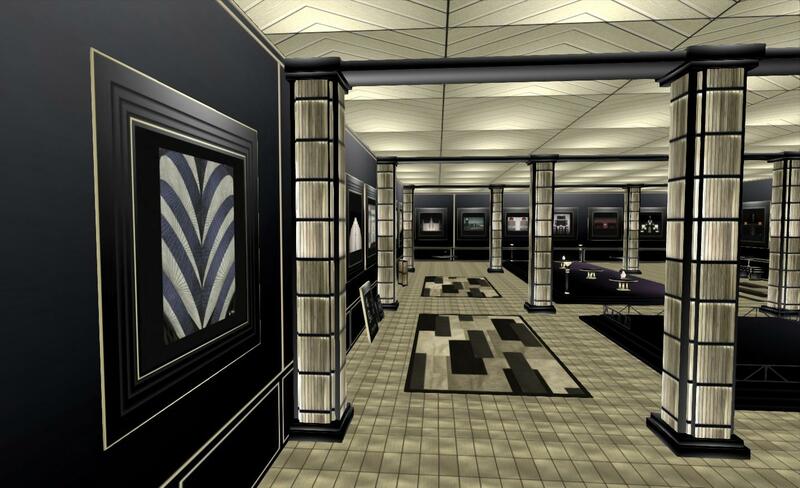 Her passion for Art Deco in SL is reflected in her Flickr photostream, where she has over 500 images of in-world places and buildings. With thanks to Quan Lavender. You’re most welcome – and thank you for the exhibition :).